The only downfall is that we're away from home 9-10 hours a day and don't get to supervise our children, right? We tend to make up for it when they're still awake when we get home or during weekends. Now here's a lifestyle event that we should be looking forward to! 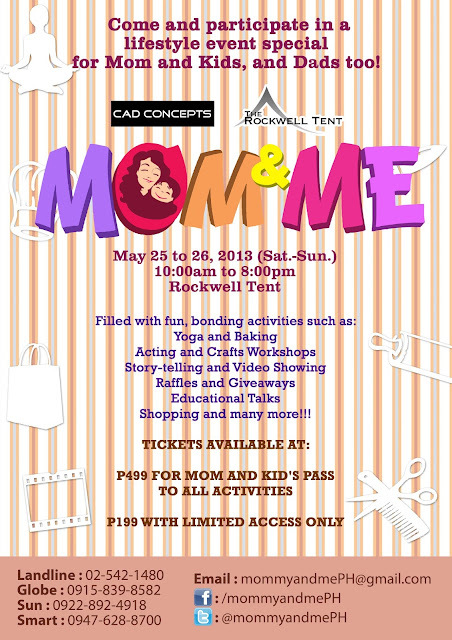 CAD Concepts and The Rockwell Tent present: Mom and Me. 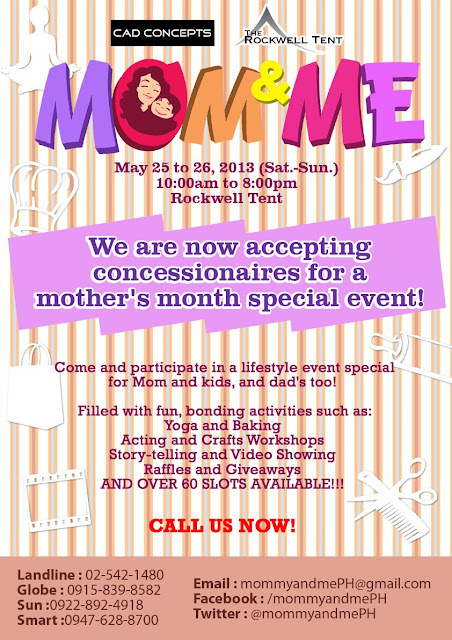 Mom and Me Event at the Rockwell Tent, May 25 to 26. Mom and Me is an event that aims to strengthen the bond and love between moms and kids through various activities such as yoga, cooking, arts and crafts workshops, shopping and many more. Coming out from the event, we hope to inspire and make moms feel like the best mom in the world! Through shared activities, we express our love for Mom and make her truly feel like the best mom in the world! Shop at over 50 top Mom and Kids brands! Isn't it exciting? They are also open for Mompreneurs who would like to be concessionaires for this mother's month special event. Below is their vendors' floor plan. Now, would you want to have a chance to enter the event with your child for FREE? Enter the Rafflecopter below and make sure to complete all the tasks. The contest is open to Metro Manila residents only and should be able to claim the tickets from me or the organizer. Contest is open from April 3 to April 15, 2013. Winners will be announced in this Rafflecopter and in the Mom and Me and Mommy Practicality Fan Page. Entry to this rafflecopter allows Mom and Me to announce the winner on Facebook. Are you going? :-) We, as moms, always look for bonding activities that we could do with our children. What do you love to do with your children? Yes sis I am. I love playing cars, balls, talking, dining out, going to amusement centers with my 2 boys. I love tickling them at night, I love the smell of their kili-kilis, I still love smelling their breaths! I'm so in love with them both @twitter-19440707:disqus how about you? We're seeing each other there right? playing ball, strolling at the park, singing songs. I still don't know my May schedule, hehe! I don't know if I will have a helper by then because she's going on vacay at the end of the month. Hope she will come back early!